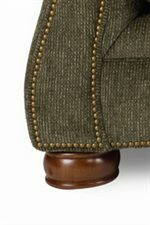 he Pembroke ottoman offers eye-catching detail that’s hard to resist. With brass nail-head trim and decorative wood feet. A comfy but resilient cushion, too. Use as a comfortable and convenient footrest or extra seat in your living room. Choose from two select La-Z-Boy fabrics or luxuriant leather. The Pembroke La-Z-Boy® Premier Ottoman by La-Z-Boy at Conlin's Furniture in the Montana, North Dakota, South Dakota, Minnesota, and Wyoming area. Product availability may vary. Contact us for the most current availability on this product. Fabric Options Choose from two select La-Z-Boy fabrics or luxuriant leather. The Pembroke Collection provides nothing less than beautiful design, fine craftsmanship and sophisticated elegance. Pembroke features a sofa, love seat, chair and ottoman. Each piece offers eye-catching detail that’s hard to resist. 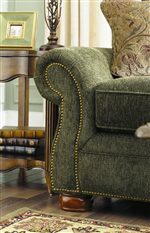 With decorative brass nail-head trim and decorative wood feet, each piece has a distinctive look. Plus, ComfortCore™ cushions and a pair of accent pillows on the sofa and love seat. Choose from two select La-Z-Boy fabrics or luxuriant leather. The Pembroke collection is a great option if you are looking for Traditional furniture in the Montana, North Dakota, South Dakota, Minnesota, and Wyoming area. Rolled Arm with Accent Pillow. Decorative Round Exposed Wood Foot. 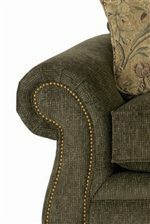 Decorative Brass Nail Head Trims the Arm Creating a Beautiful Accent. Browse other items in the Pembroke collection from Conlin's Furniture in the Montana, North Dakota, South Dakota, Minnesota, and Wyoming area.